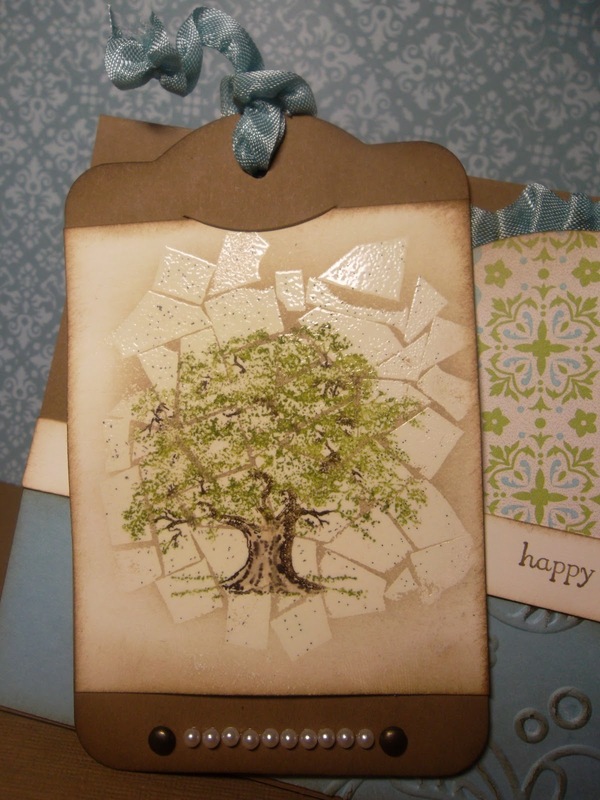 Sweet Stampin' Spot: My First Challenge Card!! I decided it was about time I participated in an online challenge. I'm an avid follower of many blogs and challenges but have never actually completed one....until now! I am pleased to announce that I played along with The Paper Players Challenge #85 "Spring has Sprung" today as well as using the sketch from Mojo Monday (even thought it's now Thursday)! I had a few goals in mind, namely to create a card that's a little more over-the-top than usual for my style, to come up with a bookmark-type element that I could possibly use for an upcoming conference a friend is organizing, and to have some new material for all of you! Less babbling, more photos, right? My colours are Soft Suede, Baja breeze, Lucky Limeade, and Very Vanilla. I used the Mosaic technique that I learned from Dawn Olchefske's blog a few weeks back. I coloured my image (from Lovely as a Tree) using Lucky Limeade and Early Espresso Stampin' Write Markers and then stamped my mosaic stamp (homemade) in Versamark. 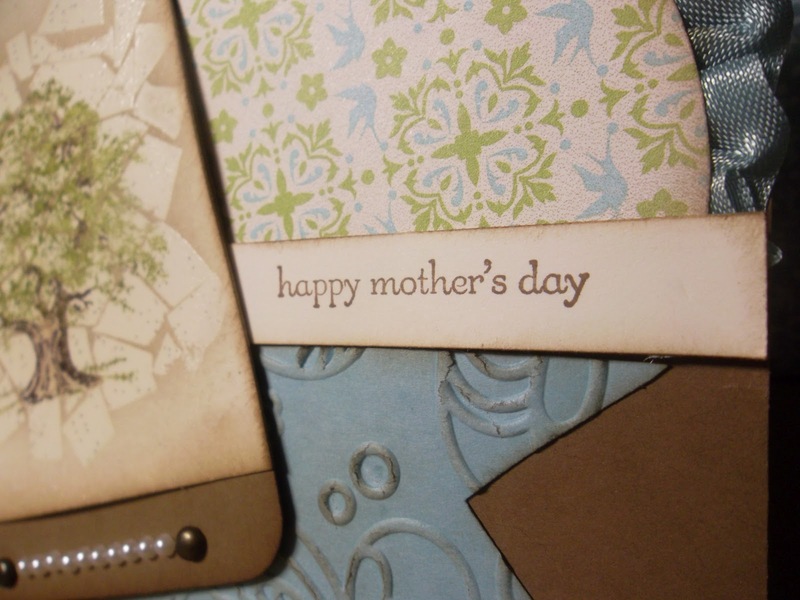 Following that, I then heat embossed with Clear Embossing powder. My clear powder had a little run in with some leftover back embossing powder in my Powder Pal hence the black flecks. Kinda looks like it's intentional or like I colour spritzed it but...no, I didn't. I need to get a new clear embossing powder. Next order. Once it cooled, I sponged some Soft Suede ink in all the grooves and then wiped off the excess with a paper towel. 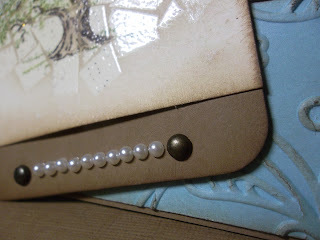 I sponged the edges of all paper layers as well to give it an aged/antique look. The bookmark/tag received a string of pearls anchored with a bronze metallic brad at either end. I like how the pearls are dainty and the brads bring in some structure. I pulled a single thread from the Baja Breeze seam binding ribbon to create the scruncy ribbon on top of the tag. 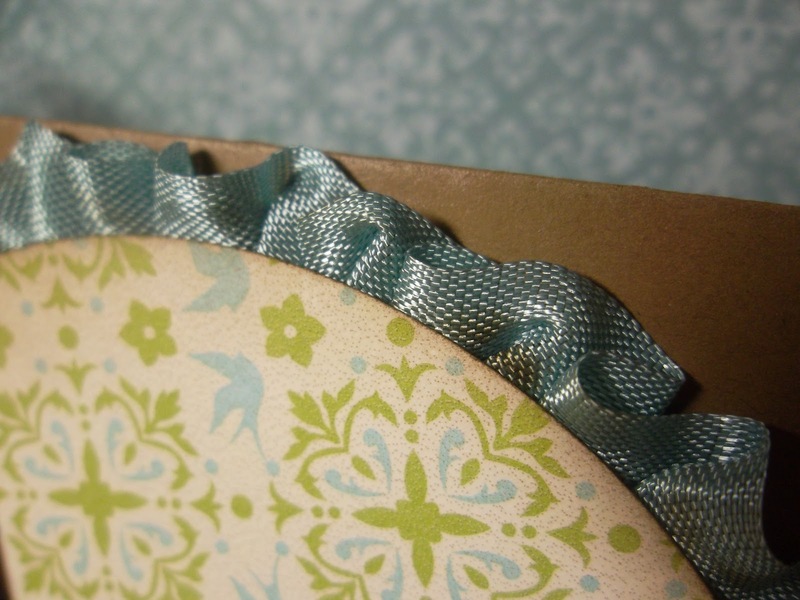 For the ribbon around the circle (Bigz Die 3 1/2" Circle) I adhered Sticky Strip to the back and then folded the ribbon over itself to created that ruffled edge. I was really pleased with how it turned out. I wasn't quite sure if it would look alright when I started. I ran the Baja Breeze pennant through the Big Shot using the Elegant Lines embossing folder and then sponged just the edges and embossed portion to help it stand out a little more. 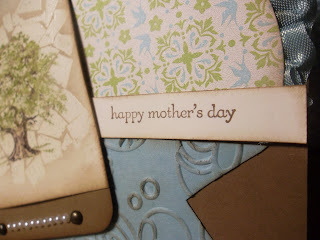 The sentiment is from Teeny Tiny Wishes (a must have stamp set!). Here's the finished card one more time so you don't have to scroll all the way back to the top! Hope you've enjoyed today's post! I sure enjoyed creating this card and may just make it a habit to participate in more of these challenges! Wow! I love it!! 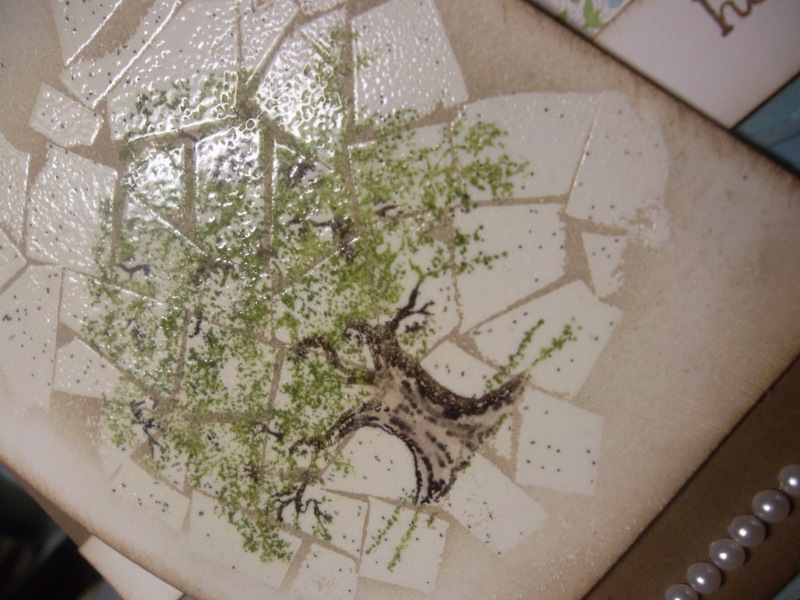 That mosaic technique is just so cool! I also like the job you did on the stamp with the markers. And I really like the effect of the pearls between the brads! 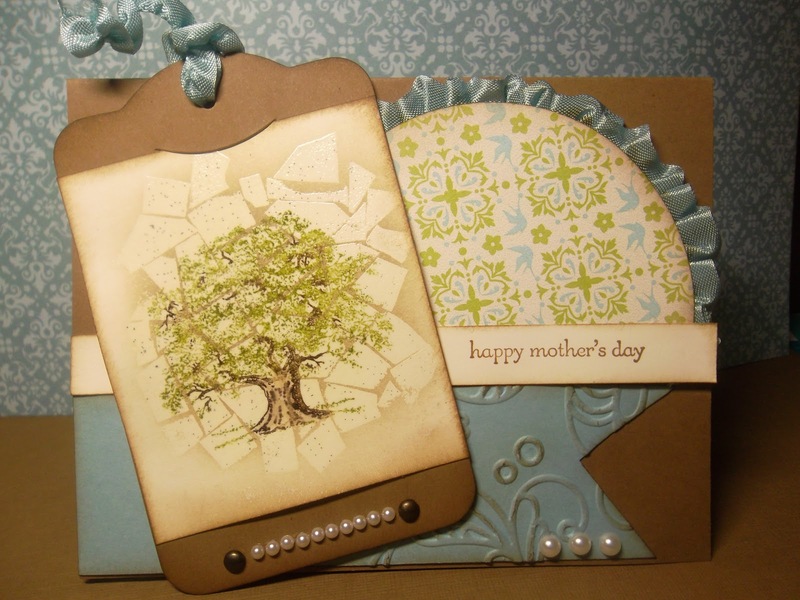 Wow, what a cool technique and the card you have created is stunning Tamara. Thank you for choosing our challenge for your first challenge!! Welcome to the fun!! Thanks for joining us at the Paper Players. Love your card! Congrats on joining in on the challenges! I saw your card on Mojo Monday! Fabulous card! So happy you picked us to be one of your first challenges. Thanks for playing with the Paper Players. I love that tree and the mosaic design!